The Super Eagles of Nigeria’s new jersey for the 2018 World Cup in Russia have been revealed as the Super Eagles gear up for this summer’s tournament in Russia. The Nigerian Football Federation launched the country’s kits for the championship in London on Wednesday. The jerseys designed by Nike, feature the home kits that pay tribute to Nigeria ’94 shirt which was worn by the first Nigerian team to qualify for the World Cup – with eagle wing-inspired black-and-white sleeve and green torso while the away kits boast of the full green strip in a classic fashion. Alex Iwobi and Sophia Omidiji were among the models for the unveiling of the new kit. 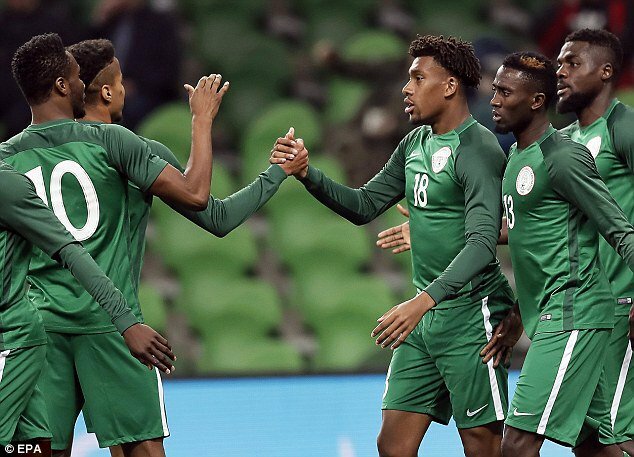 Gernot Rohr’s men will wear the shirts for the first time on March 23 when they face Poland in a friendly in Warsaw before the commencement of their World Cup campaign against Croatia at the Kaliningrad Stadium on June 16.